It says something about the state of our society when seven people can sit in the back room of a coffee shop and write … and attract the stares of the other patrons and even the attention of the local newspaper. The seven of us are all writing feverishly and yet we’re making more noise than most of the patrons in the main room combined. How can this be, you ask, if the writers aren’t talking but are only writing their brains out? Well, dear reader, I am writing this from The Great American Type-In at Cafe Kolache in Beaver, Pa. 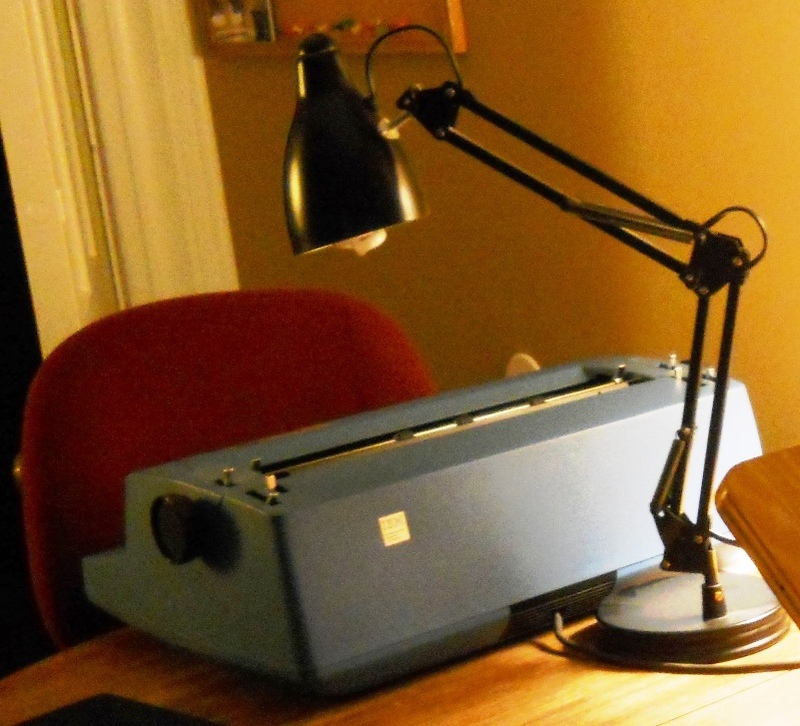 Yes, we’re typing … but we’re typing on typewriters. Not just any typewriters, either. There is no electricity required for this type-in. 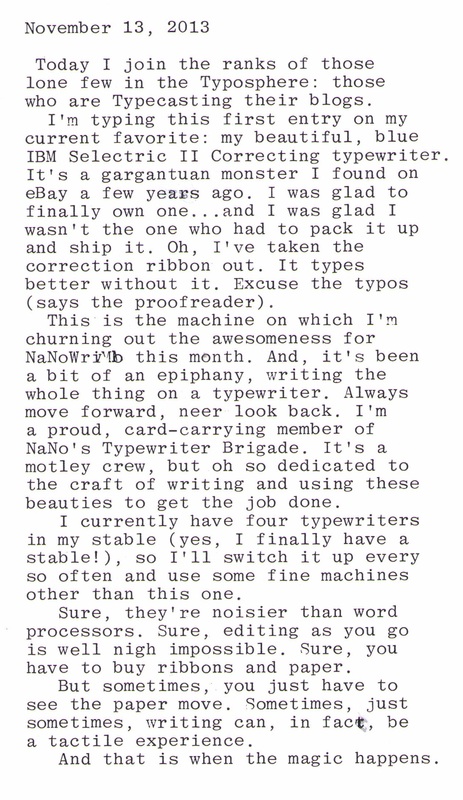 We’re sitting here using manual typewriters. The strange part is all the prep work we had to do to get to this point. 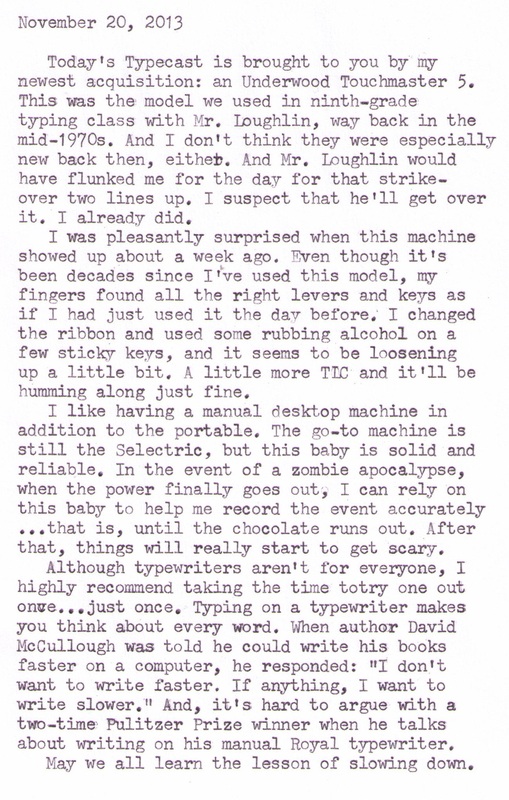 Hugh can’t figure out how to release the carriage on his typewriter, and there are cries of “Release the Carriage!” from all corners of the room. Three writers hover around the Olympia typewriter, pushing every piece of metal sticking out of the thing, trying to get the platen to move. The victory shouts when the thing finally sails off to one side are deafening. But not as deafening as the noise coming from the other six keyboards. Someone else tries to find the “on” button on hers. (Okay, that was me.) Turns out a manual typewriter doesn’t have an “on” button. How very retro. Shouts emanate from the gallery once we start the typing proper. My spacebar (which is not to be confused with the space bar in the first Star Wars movie) keeps giving up on me, and some of my words run together with no spaces before I catch the problem and physically pull the entire key set back into place. I discover early on that my old Royalite doesn’t even have a tab key, and I must resort to the old method of manually spacing five counts on the spacebar to make a simulated tab. The problem, of course, is that the aforementioned spacebar doesn’t always work, and so I end up with no tab/indent at all … and after all that hard work, too. 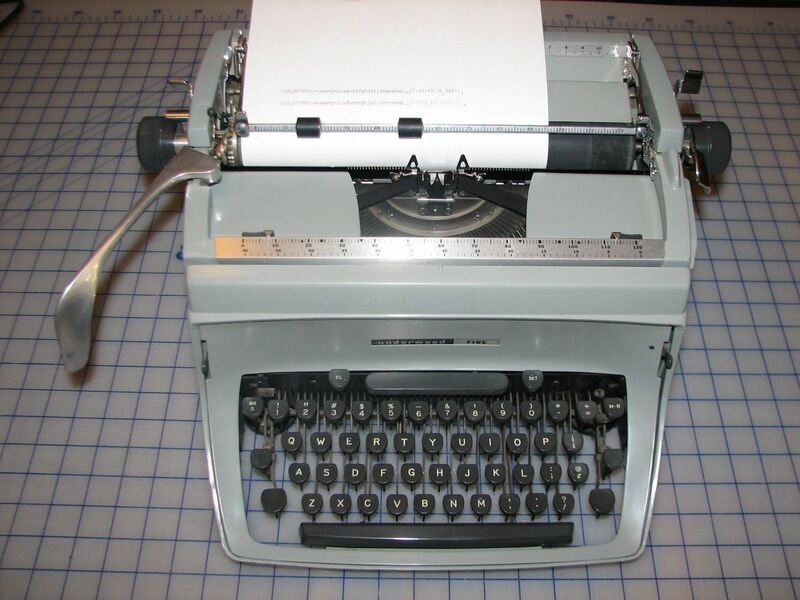 Most of us have now been reduced to using three or four fingers since these blasted things have such sticky, difficult keys that we need some real “oomph” behind our typing to get the letters to show up on the page. And don’t get me started on those sticky keys. I spent too much time last night prepping the keys with a few dozen Q-Tips and some rubbing alcohol … and the question mark key is still sticking. As a proofreader, I find this entire exercise vexing to the point of tears. I am making typos so fast I feel I will faint from the carnage. They’ll have to cart me off weeping and gnashing my teeth by the time we’re done here. I just checked the clock and it has taken me over an hour to type this much. Amazing how much my typing productivity plummets when I have to pound the keys. 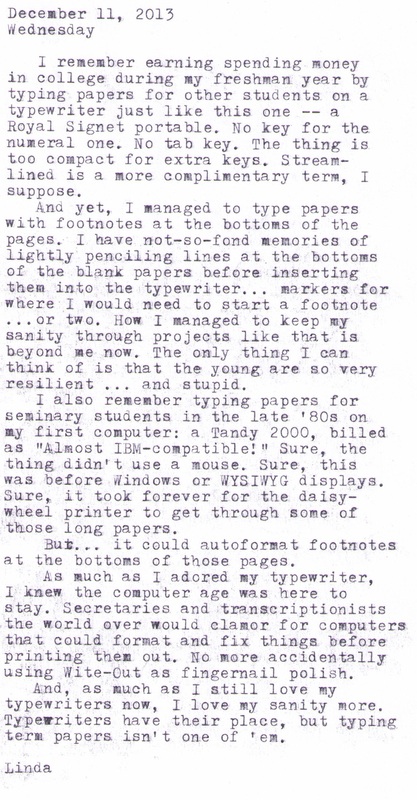 That last paragraph has taken me twenty minutes to type, but this time it isn’t the typewriter’s fault. Hugh and Val have launched into a recreation of the last scene of It’s a Wonderful Life, complete with all the characters’ voices. We all feel the need to stop and listen and encourage them (not that either one of them needs encouragement) … if only to give our tired index fingers a rest. I have tried not to mention Val’s typewriter because, well, it might embarrass him. You see, he brought this bright red plastic thing—well, it looks plastic, but it might actually have some metal on it—and I swear I saw a Fisher Price logo and an emblem of the Cookie Monster on the side. And that end-of-line bell sounds suspiciously like the Good Humor truck. But hey, it doesn’t have a cord or a battery, so it’s all good. Even if it does look more like a prehistoric Speak ‘n Spell. Nate’s contraption (another Royal) has a button that says “Magic Column” on it. I begin to wonder if we should allow typewriters that have magic keys on them. Hell, I don’t even have a tab key, let alone a magic key. I sense a growing hierarchy of typewriters in the room. I hadn’t expected to experience typewriter envy, but I think some of us are ogling Roe’s old Remington Rand. I know I am. Not so much Val’s plastic Radio Flyer typewriter. Well, no, okay, that one too. I sit here wondering how prolific writers of old ever churned out all those pages when it feels like a gym workout to get twelve words down at any respectable rate of speed. And now, having brought my productivity down to a mere two fingers, I find I have to look at the keys to make sure I hit the right ones at least ten percent of the time. But I’m also starting to see the sheets of finished paper coming off the platens, being placed lovingly on the table around me. All facedown, of course, because we’re all trying to hide the rampant typos spilling off every page. Well, okay, every line, really. None of brought any Wite Out, and even I occasionally long for a spell checker. We have a ten-minute discussion on how to spell “bizarro,” followed by another on how to spell “commode.” Both questions come from the same person—okay, it was Val—so we all begin to wonder just what he’s writing over there. Then we realize that no, we probably don’t want to know. Then they see seven of these things sitting on the long table, and their jaws drop. We look like the sad rejects of a small town news room, and Val’s fedora with the handwritten “PRESS” pass bears this out. Not to mention Hugh’s bowler hat, which I just mentioned. And, like any cultural oddity, any societal deformity, we are eventually left alone again and ignored. Nothing to see here, people, nothing to see here. Move along…. Hugh’s ribbon has now come to an end and has decided not to behave properly. It’s supposed to reverse course on its own but it has abdicated this responsibility. It takes Hugh two minutes to figure out how to open the typewriter up to even get to the ribbon, and then he and Rachel take another ten minutes to figure out how to turn the ribbon around. They sound like car mechanics over there, and now Hugh has come back with a flashlight to look under the hood. Another five minutes and they have the old ribbon out and have turned it around. There is a strange sense of pride when you get one of these beasts to submit. It’s one thing to work out a software glitch with a Windows update … but it is not as satisfying as getting one of these mechanical monsters to type that stray “e” that has been sticking on you for the first hour of typing. Our time is up and we’re wrapping things up now, after two hours of clicking and clacking (and bemoaning the fact that there was no whiskey in our coffee). I realize that, if we had been typing on laptops and tablets and netbooks, we wouldn’t have heard nearly as many cries of “Ouch!” … which came from those of us who got our fingers caught under the keys, where little keyboard monsters hide and nip at our fingertips. We’d have gotten more words written—properly spelled words, properly spaced words, words that would be readable once we got home—but they wouldn’t have been better words. Just prettier words. These words, our words, came with copious amounts of literal blood, sweat and tears today. We will meet again, and we will conquer these machines. And, next time, like the fabled writers of old, there will be whiskey in our coffee. Otherwise, most of us won’t show up.